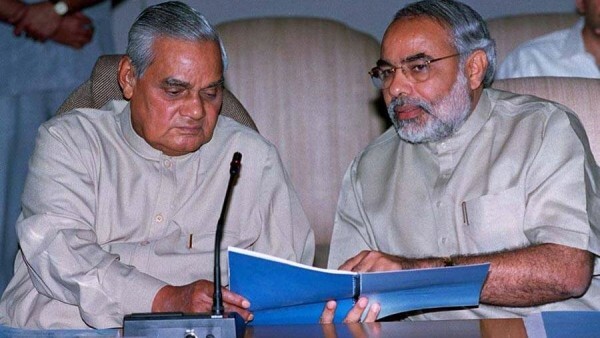 Modi with Vajpayee after the 220 riots. From this aspect, his death has come at an inconvenient time for the party because there will be constant reminders during the run-up to the four state assembly elections this winter about Vajpayee’s gentleness, which was his foremost political talent. This will be particularly relevant in the matter of rhetoric which has tended to become increasingly acerbic in recent times. The chances of the speeches becoming more venomous are all the greater when the BJP’s prospects are not supposed to be all that bright in the key states of Rajasthan, Madhya Pradesh and Chhattisgarh, as a poll survey has predicted. Therefore, as caustic comparisons are made between aristocratic lineage and the humble background of a worker — naamdar and kaamdar — Vajpayee’s more temperate oratory may be recalled. It was Vajpayee’s moderation which enabled him to hold together for more than three years from 1999 to 2002 a mahagathbandhan (grand alliance) of as many as 24 parties, the likes of which had never been seen before and is unlikely to be seen in the future. What is more, doubts are being expressed as to whether the BJP will be able to form a coalition at the Centre if it fails to secure a majority of its own in the Lok Sabha in 2019 because Modi is seemingly temperamentally averse to act in tandem with others. Bihar Chief Minister Nitish Kumar’s restiveness is a reminder of this proclivity at the NDA’s highest levels. If Vajpayee’s accommodativeness cannot be seen in the BJP today, neither is its ability to push ahead with the economic reforms as during the former Prime Minister’s reign when several PSUs such as Modern Foods, Balco and Hindustan Zinc were disinvested. In contrast, the present government has not been able to find a buyer for the perennially sick Air India. However, the most crucial of Vajpayee’s legacies is the peace which prevailed in his time till the Gujarat riots of 2002, which paved the way for his defeat two years later as he ruefully conceded. Before the riots, however, there was nothing like the present near-anarchic scenes which have made the Supreme Court bemoan the prevailing mobocracy as the “new normal” and the Centre to consider enacting a law to stop lynchings. It would be a mistake, however, to claim that Vajpayee did no wrong. The targeting of Tehelka and Outlook magazines because of their embarrassing disclosures about the unsavoury goings-on in high places is a reminder that no government — not even Vajpayee’s — can be tolerant of a genuinely free press. It is an unworthy legacy going back to Rajiv Gandhi’s abortive attempt to muzzle the media with his proposed Publication of Objectionable Materials Act in the wake of the Bofors howitzer scam, not to mention his mother’s draconian Emergency rule. But, for Vajpayee, it was an uncharacteristic misstep in the misuse of the Enforcement Directorate and other government agencies, which has largely been forgotten. What is remembered instead is the fact that of all the saffron leaders, he was the only one who had the Nehruvian vision of the “idea” of a multicultural India. It was this broad outlook which made Vajpayee urge the Jan Sangh in 1960 to open its doors to “all Indian citizens irrespective of creed or sects”. Noting that at least formally, the party is opposd to politics being linked with religion, he said that “in the partition of the country, we have already had a grim experience of the consequences of mingling politics with religion”. Not surprisingly, Vajpayee was not a favourite of the Rashtriya Swayamsevak Sangh (RSS) despite the swayamsevak tag that he wore all his life, which is why one of the RSS chiefs of his time, K.S. Sudarshan, wanted his as well as L.K. Advani’s ouster from positions of power by calling for a generational change in the BJP. Now that a generational change has taken place in the BJP, it has to be seen how many of Vajpayee’s inheritances are honoured and how many disregarded. If his moderation does not gell with the party’s aggressive pro-Hindu line, which made observers say that Vajpayee was the right man in the wrong party, the BJP can at least acknowledge his adulation of Jawaharal Nehru (whom the party likes to dislike at present) as Bharat Mata’s “favourite prince”. As Vajpayee’s accolade to Nehru showed, not all naamdars are to be shunned.